In a relationship, there are stages of grief, denial, and acceptance once the relationship comes to an end. The same holds true in relationships between fans and the players they love. As far as the relationship between Albert Pujols and the St. Louis Cardinals, I went through grief and denial, but never fully accepted that he was actually gone until now. I'm not going to lie. I miss Albert. Every season that Albert was a member of the Cardinals, I was excited to attend at least two or three games at Busch Stadium. I know, I know, aren't REAL fans supposed to support the team regardless of whether Pujols is there or not? Yes, in a perfect world, they are. But spending my hard earned cash on the Albert-less Cardinals just doesn't seem to be worth the money. The best way I can explain my rationale is by using the Home Run Derby and the Slam Dunk Contest as proof of my point -- that attending a game without the main attraction just can't ever be the same. Does a 360 between-the-legs dunk have the same appeal when DeMar DeRozan does it? Where did DeMar Derozan even go to college? What NBA team does he play for? I doubt most people know. Does a barrage of home runs during the Home Run Derby from a guy like Joey Votto raise the same excitement level as when Josh Hamilton put on a mega show at Yankee Stadium? The answer is no -- they do not. For some reason, sports are just more exciting when you get to watch superstars, and that cannot be overridden. Some fans may say, real fans don't care if a superstar leaves. Hey Orlando Magic fans, will you still go watch the Dwight Howard-less Magic? Colts fans, if you didn't get Andrew Luck would you have gone to watch the Colts without Peyton? I honestly don't think you would, because superstars make watching sports exciting. The Cardinals may have a decent team without Albert, but Matt Holliday and Carlos Beltran just aren't 'bathroom can wait' players like Albert, who made you believe that he might do something amazing every time he was at bat. I also miss Albert because I wanted to be able to say that I saw him play in person during his first season as a Cardinal and also during his last season as a Cardinal, which I hoped would be his ride off into the sunset season that would grant him a statue outside Busch Stadium, his No. 5 retired, and a bust in Cooperstown wearing the St. Louis ball cap. That dream just sounds right. But according to Albert, God told him to go to Anaheim and chase the money I guess. I didn't know God would pick a path that was all about money, instead of a path that was more about being humble -- i.e. Kevin Durant of the Oklahoma City Thunder. Why did you go Albert? St. Louis was your city and your fans loved you. LA fans could care less about baseball and Pujols, they just want stars. In St. Louis, Albert's skills deteriorate in acceptance; in LA, he will be viewed as a waste of money. Yeah. It's finally starting to sink in now. I'm not going to lie. I miss Albert. This hit close to home. 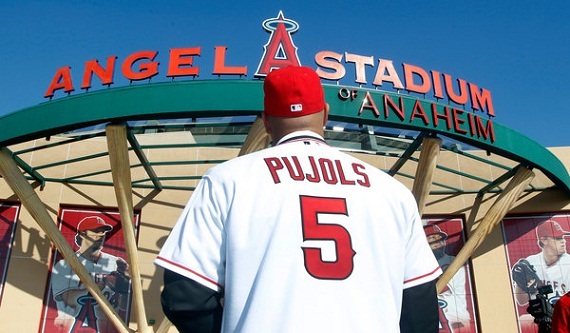 I'm not going to lie, I cried when Pujols signed with the Angels. A 38 year old man grown man crying like a baby over a player. Sounds silly, but its true. I'm originally from St. Louis, and we hold our beloved athletes near and dear to our hearts. I'm still a fan of his, but its not the same. He should have stayed in St. Louis. And I agree with you. I know most Cardinal fans try to play it off and act like its not that big of a deal, but it was, and still is. Its not the same without Albert being on the team. Its just not. I miss him too. Nice post. I worshipped the ground he walked on only to watch him sellout and go to Cali. Now I hate him. Traitor is all he is. Even hearing his name now makes me sick to my stomach. I know what you mean though Kyle. Cards aren't the same product now. I still find myself at times doing double takes at the tv when Sportscenter is talking about the Angels at Pujols is brought up. Something most Cardinal fans will never get over. Great post. I was in loser denial for awhile, but I've started to come out of it lately. I miss the guy playing the game hard in a Cardinals jersey. The same Cardinal red that guys like Stan, Lou Brock, Red, Ozzie, Willie, Joe Medwick, Bob Gibson, Bob Forsch, Enos Slaughter, Dizzy Dean and many others wore until they couldn't play any longer. Our greatest players have always retired Cardinals or were traded - we're not used to them just leaving. I think that's what stings the most.